Working on a book, I’ve decided to brew a few hop-related experiments and utilize lab testing to accompany the sensory information in areas I couldn’t find enough existing academic research. One such trial was to test whether or not yeast pitch concentrations affects hop compounds making their way into the final beer. Specifically, would double the amount of yeast (two packs hydrated S-04) result in less tested hop compounds than the same beer brewed with approximately 3/4 of a packet of S-04? 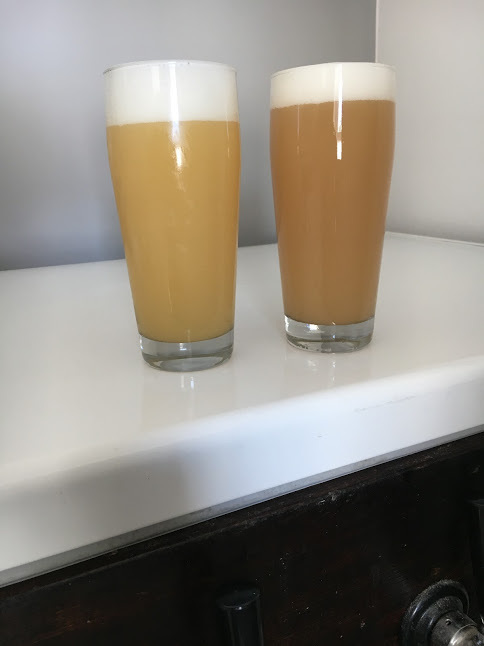 Unfortunately, I’ll have to wait awhile to get an answer to the above question because one of the two beers had noticeable oxidation immediately after kegging, completely throwing off any sensory testing. Nobody likes putting in all the work into a batch and having it go bad so quickly, but why this particular hazy IPA oxidized so rapidly may be just as useful as what the experiment was intended to test. The beer that oxidized fermented in a 10-gallon keg that had a leaky lid, the non-oxidized beer fermented in a Big Mouth Bubbler with a waterless airlock. I like fermenting in a 10-gallon keg for a few reason, but I’d prefer somebody just make a 6.5-7 gallon keg, which would have all the benefits below but without the excessive headspace. There is plenty of headspace (perhaps too much) to ferment 5-6 gallons of beer, which comes in handy when fermenting with top cropping English strains. I can put a filter over the dip tube and dry hop loose in the keg and still transfer into a serving keg without clogging the poppets with hop debris. I have had issues with strains like London Ale III gumming up the filter, a slight cold-crash seems to help with this (even just down to about 50-55F). When dry hopping, I can hook the gas line up to CO2 and purge the headspace the entire time I’m tossing in hops. Finally, using a spunding valve, I can transfer out of the 10-gallon fermenting keg to a serving keg via CO2 and at a controlled and steady pace, preventing any foaming. One issue with my particular 10-gallon keg is it’s a little challenging to get it to seal. Typically, I’ll have to shoot it with CO2 while lifting it up by the lid putting pressure on the gasket until the pressure seals it. Soon after I release the pressure, however, the keg usually loses its seal. For this beer, I hooked up a hose to the gas out ball lock barb letting the other end of the hose sit in sanitizer, essentially creating a blowoff tube. The blowoff isn’t even necessary if the keg isn’t sealing, which would let out any CO2 to escape that is created during fermentation. While this beer was in primary, I was in Denver for GABF, which meant I couldn’t keg the beers until two-weeks after brewing. Considering the beer was likely done fermenting about five days into fermentation (S-04 is a quick fermenter in my little experience with it), it sat for nine days with 5-gallons of headspace and a leaky lid. None of this seems like it should matter that much, which is why I wasn’t worried about it, but apparently, the conditions were right to accelerate oxidation for this hazy IPA. When I got back from GABF, I dry hopped the beer with its second charge, while purging the headspace with CO2 and then sealed the 10-gallon keg and put on the spunding valve and set it to 5 PSI, to avoid oxidation (ironically). I wish I would have taken a sample at this point, I likely would have already noticed the oxidation issues and could have saved myself some kegging time and hops! After two days at room temperature to allow the dry hops to extract, I transferred to a purged serving keg that maintained pressure during the keg-to-keg transfer. What I should have done is use a spunding valve instead of a blowoff tube for the entire duration of fermentation, and it set just high enough to hold the seal (probably 2-3 PSI). I also could have transferred the beer to the serving keg before I left for Denver. In fact, moving hazy IPAs to a keg early is probably a good practice to follow anyways, as this allows the beer to finish up the ferment in the new keg helping to scrub any oxygen that may have been picked up during the transfer. Apparently, headspace oxidation can be an issue with hazy IPAs particularly after primary fermentation has completed. 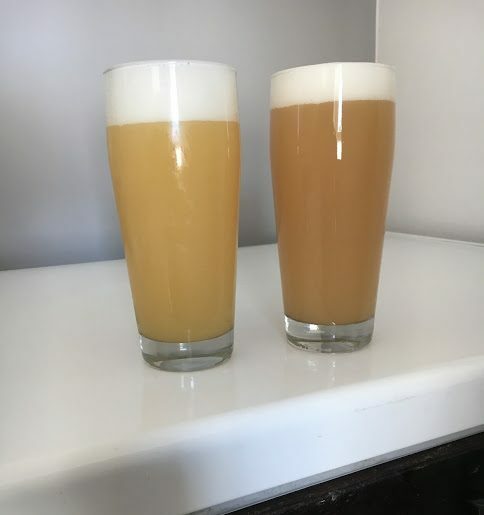 The sensitivity of hazy IPAs to oxidation, it is probably best to transfer them to a few gravity points to go or even adding a little priming sugar to the keg to allow some re-fermentation to take place in the serving keg if primary has completed. Leaving the keg at room temperature for a few days would give the yeast time to work on the sugar, as well as allow any keg hops to extract at room temperature (the yeast activity might also encourage the hops to stay in suspension). This advice might be more relevant when using fermenters that don’t efficiently seal, like with buckets (or this stupid keg). I’m rethinking the headspace in my 10-gallon keg fermenter (especially for hazy IPAs). I’m going repeat this yeast pitch experiment with two Big Mouth Bubblers with waterless airlocks (which typically seal great). I might as well post my tasting notes for the good half of this beer, which happened to be the one that was overpitched with two packs of S-04. The haze in this beer is intense. It’s hard to make a bad hoppy beer when you’re using Citra and Galaxy! Well, unless you let it oxidize prior to being kegged that is! Big tropical berry-like and strawberry aroma jumps out of the glass. Reminds me a little bit of pink laffy taffy, something I’ve noticed before with this combination of hops. Maybe it’s because I know this beer got the double dose of yeast, but at times I think I’m smelling a “yeasty” character, think of the smell of a pack of yeast hydrating. I’ll have to see if I pick up on this same thing when I re-brew the experiment. Safale S-04 can make a pretty decent NEIPA, I’m a big fan of not having to make a starter! 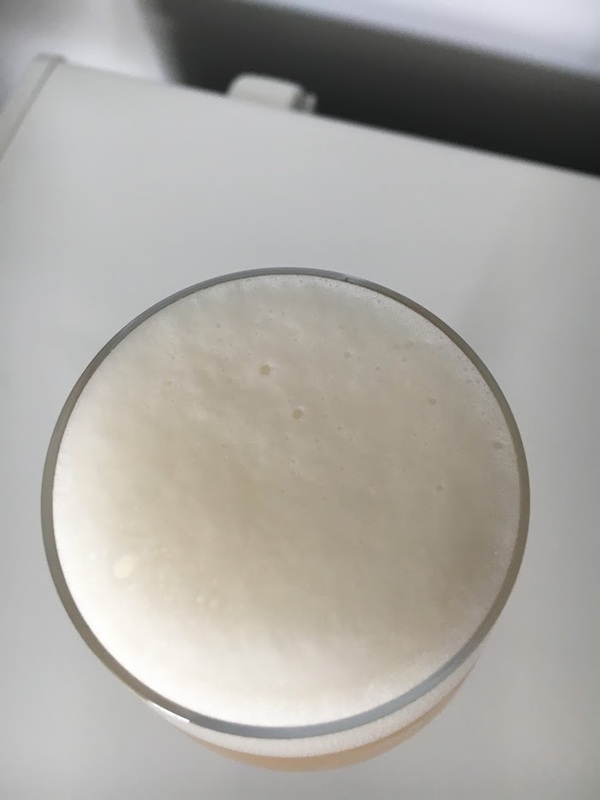 Just like in another NEIPA I tasted made with S04, however, it seems like it might be muting the flavor a touch. Maybe this is because of the excessive yeast pitch in this particular beer, but there’s a blandness to the flavor that doesn’t quite match the nose. S-04 also seems to attenuate better than other NEIPA strains, despite the high mash temperature. Maybe some more late hot-side hops could help with this. Overall it’s a decent hazy IPA, but not one of my best. The head retention in this beer is great considering how heavily hopped it is. This is the second time I’ve used a large percentage of chit malt in the grist and I’ve been happy with the increased retention in both of these beers compared to most of my previous hoppy beers. Chit malt is under-modified 2-row, that is barely malted. Even though the protein percentage of chit malt is similar to 2-row it’s the reduction in the modification of these proteins during malting, not the total percentage of protein, which can ultimately help with head retention. The protein makeup of this beer is also likely playing a role in the intense permanent haze. 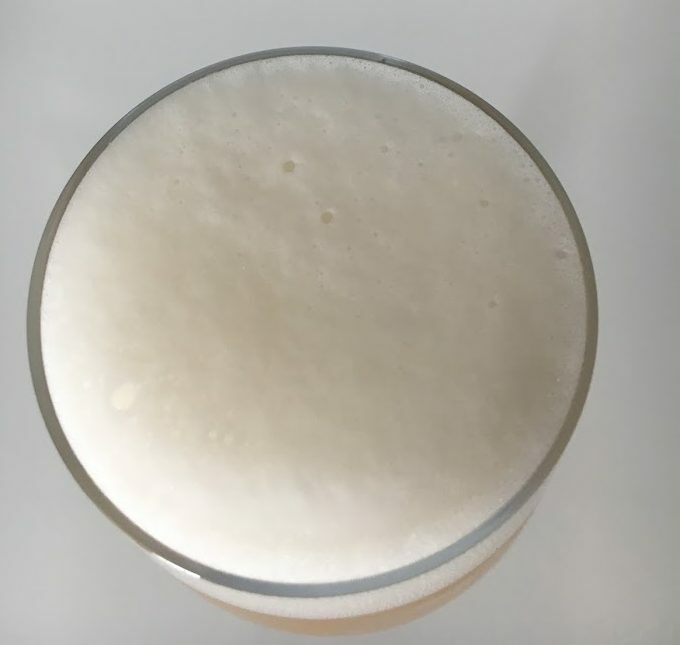 A potential explanation for the increased head retention is likely due to the fact that it’s not until LTP1 (a protein linked to improving beer foam) undergoes modifications during the malting and brewing process does it have positive effects on beer foam. 1 In addition, LTP1 is decreased in concentration during malting, likely due to Maillard-reactions that occur during the kilning. 2 So you can see why chit malt may help with retention since it’s still malted, but for a short time, likely allowing for more LTP1 concentration. The foam is the chit! Klose, C., Schehl, B., & Arendt, E. (2008). Protein Changes during Malting of Barley using Novel Lab-on-a-Chip Technology in Comparison to two-dimensional Gel Electrophoresis. BrewingScience, 56. How was the mouth feel without any oats in comparison to other neipas you’ve brewed in the past? It’s got a great mouthfeel, I should have included that in the post! I’m guessing the protein combination between the malted wheat and chit malt are playing a big role. Interesting. Can you tell me a little bit more about this process? You cold-crash your fermentor, then transfer that beer onto the wort/yeast mixture in the keg? I don’t always cold-crash beers, but when I do I typically do a “soft” crash which is a drop by about 10-20 degrees for a few days. I will then transfer the beer into a clean keg (sometimes with more dry hops). 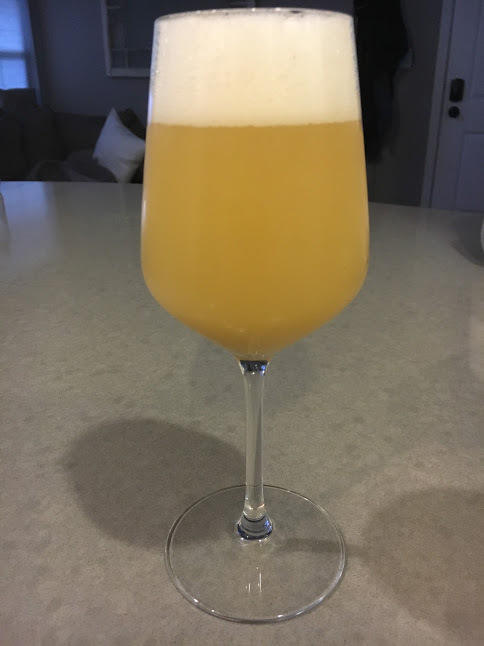 I made a few hazy IPAs using S-04 and one had a bit of other yeasts involved alongside S-04. I mash high at 154.4F/68C and I always get around 80-82% attenuation, which always drives the FG down to 1.012, which is low, but acceptable. 1. The hazy ones had no crystal malts whatsoever, where as the traditional ones had. Makes me believe a little crystal helps with colour (stability), taste and overall beer flavours and stability. 2. The hazy ones had massive loads of hops and felt harsh from day 5 to day 20. The traditional ones were actually drinkable from day 10. 3. The hazy ones have a bigger amount of salts added to the mash and sparge water. Would it be possible to establish if crystal malts do offer some advantages? Not only for NEIPAs, but beer in general. That’s a lot of hops! Hopefully that’s a 10-gallon batch. Regarding crystal malts, it’s likely the opposite. Crystal malts can reduce the oxidative stability in beer because the Maillard compounds in caramelized products can accelerate metal-catalyzed oxidation. Hello Scott! Do you have any source to share about Maillard and oxidative stability ? I’ve found some research that show Maillard compounds can reduce oxidation https://pastel.archives-ouvertes.fr/pastel-00003240/document. Even dough the overpitched removed som flavor a fear assumption is, it also protects the beer a bit better. Lot`s of hops tends to affect the yeasts performance. How do you think chit malt compares to flaked barley in terms of mouthfeel, protein contribution, flavor, haze?